Are you ready for home spring cleaning? 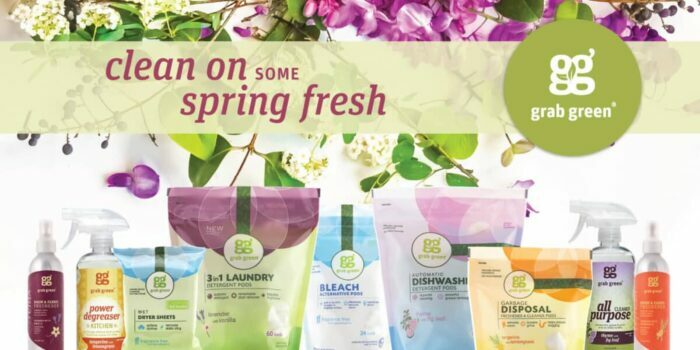 Spring starts in just a few days, and I can’t wait to deep clean my house to make it spotless and fresh, and that means I need to get my cleaning supplies ready. When choosing cleaning materials, I make sure that they are environmentally safe and non-toxic but still does its job or even work better than those chemical-laden products available in the market. Recently I discovered this new brand called Grab Green that offers amazing natural cleaning products. They have nontoxic and eco cleaning supplies line that are effective and safe for you and your family. Plus, recent scientific tests shows that Grab Green’s laundry and dishwashing pods are superior to conventional brands in removing many of today’s toughest stains and soils. Order Grab Green’s products now here and use our special 25% off discount code: spring25, to save on all of their cleaning products! Grab Green is offering 500 FREE Home Cleaning Bundles starting March 14. All you have to do is to go to: http://www.grabgreenhome.com/homecleaningbundle/! Shipping is not free but it’s only $6.99 for 7 cleaning products so that’s a steal! And that’s not all we’re also giving away two sets of special Grab Green product bundle! Giveaway ends on March 31, 2017 at 11:59pm EST. • NEW Stoneworks Laundry Detergent Pods (50 loads per bag) – Especially (though by no means solely) for millennials, recyclers and outdoor enthusiasts, this cost-effective and eco-responsible line features a collection of earthy fragrance profiles. Choose from 5 fragrances: Birch, Oak Tree, Rose Petal, Olive Leaf, and Rain Fragrance Free. • Cookware & Bakeware Cleaner. No more scrubbing pots and pans! Offering ease, convenience, natural purity and robust cleaning power to home and professional chefs, cooks and bakers alike, Grab Green’s plant and mineral-based cookware and bakeware cleaners are naturally-derived and feature a non-toxic formula that’s safe and completely effective. • Automatic Dishwashing Detergent Pods. (24 loads per bag) – Grab Green’s Pods are a powerful grease remover and will leave your dishes sparkling clean. Comes in four fragrances: Thyme with Fig Leaf, Red Pear with Magnolia, Grapefruit with Cranberry, Tangerine with Lemongrass, and Fragrance Free. Grab Green is available nationwide in most major retailers (Ralphs, Whole Foods, and etailers (i.e. Amazon, vitacost, iherb). Check out this store locator. Disclosure: This is a sponsored post on behalf of Grab Green but all opinions expressed here are mine.